“I’ve been on the street for 30 years, and I’m still here.” EPIX just released a new trailer for their upcoming TV show, Godfather of Harlem. 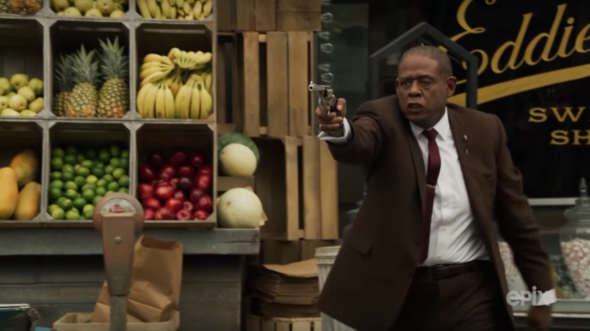 The crime drama “is inspired by the story of infamous crime boss Bumpy Johnson (Forest Whitaker), who in the early 1960s returned from ten years in prison to find the neighborhood he once ruled in shambles. With the streets controlled by the Italian mob, Bumpy must take on the Genovese crime family to regain control.” The cast also includes Vincent D’Onofrio, Giancarlo Esposito, Paul Sorvino, Nigel Thatch, and Ilfenesh Hadera. Godfather of Harlem premieres on EPIX this fall. Premiering on EPIX this fall, Godfather of Harlem is inspired by the story of infamous crime boss Bumpy Johnson (Whitaker), who in the early 1960s returned from ten years in prison to find the neighborhood he once ruled in shambles. With the streets controlled by the Italian mob, Bumpy must take on the Genovese crime family to regain control. During the brutal battle, he forms an alliance with radical preacher Malcolm X (Thatch) – catching Malcolm’s political rise in the crosshairs of social upheaval and a mob war that threatens to tear the city apart. Godfather of Harlem is a collision of the criminal underworld and the civil rights movement during one of the most tumultuous times in American history. What do you think? Are you a fan of mob dramas? Will you watch Godfather of Harlem? More about: EPIX TV shows: canceled or renewed?, Godfather of Harlem, Godfather of Harlem: canceled or renewed?